After a time, Hal got up and wandered down the hall to the nook he’d taken over as his study. It was cramped as an eggshell, but he didn’t need much space—and the close confines seemed to help him think better, shutting out some of the outside world. He plucked a quill from the jar and bit it absently, tasting the bitter tang of dried ink. He should cut a new one, but couldn’t summon up the energy to find his pen-knife, and after all, what did it matter? John wouldn’t mind a few blots. The paper felt gritty with dust; he didn’t let anyone touch his desk. He held up a sheet and blew at it, shook it a bit and set it down, then dipped his quill. After twiddling the quill for a while, he gave up, wrote, “Luck. —H,” sanded the sheet, folded it, and taking up the candle, dribbled smoke-stained wax onto the paper and stamped it firmly with his signet. A swan, flying, neck outstretched, across a full moon. He was still sitting at his desk an hour later. There was progress: John’s letter sat there, squared to the corner of the desk, sealed and with the Armstrongs’ direction in Aberdeen neatly written—with a freshly-cut pen. The quire of parchment had been shaken free of dust, tapped into alignment and put away in a drawer. And he’d found the source of the dead-flower smell; a bunch of rotting carnations left in a pottery mug on the windowsill. He’d managed to open that window and throw them out, and then summoned a footman to take the mug away to be washed. He was exhausted. He became aware of noises in the distance; the sound of the front door opening, voices. That was all right; Sylvester would take care of whoever it was. To his surprise, the butler seemed to have been overcome by the intruder; there were raised voices, and a determined step coming rapidly toward his sanctum. “What the devil are you doing, Melton?” The door flung open and Harry Quarry’s broad face glowered in at him. Harry strode into the room, lit a taper from the fire and lit the candlestick on the desk. Hal hadn’t noticed it growing dark, but it must be tea-time, at least. His friend lifted the candlestick and examined him critically by its light. “Wash—oh, Jesus.” He’d risen halfway out of his chair at the name, and now sank back, feeling hollow at mention of his solicitor. “I’ve spent the last hour with him, after meeting with Anstruther and Josper—you remember, the adjutant from the 14th?” He spoke with a strong note of sarcasm. “I do,” Hal said shortly, and rubbed a hand hard over his face, trying to rouse his wits. Washed, dressed, brushed and feeling some semblance of ability, he came into the library a quarter-hour later, to find the tea-trolley already in place and a wisp of aromatic steam rising from the teapot’s spout, to mingle with the spicy scents of ham and sardines and the unctuous sweetness of a currant sponge, oozing cream and butter. “When’s the last time you ate anything?” Harry demanded, watching Hal consume sardines on toast with the single-mindedness of a starving cat. Harry disposed of his own cake, swallowed, and replied. “Well, you can’t actually be tried in open court. Whatever you think about your damned title—no, don’t tell me, I’ve heard it.” He held out the palm of his hand in prevention, picking up a gherkin with the other. “Oh.” Hal hadn’t given the matter a moment’s thought, but if he had, would likely have reached a similar conclusion. Still, he felt some relief at hearing that the Honorable Lawrence Washburn, KC, shared it. “Yes.” Hal took it and reached for the mustard pot. Harry took an egg sandwich instead. Hal set down his fork and stared at Harry. “Balderdash,” Hal said shortly. But his hand trembled slightly as he lifted the tea-pot, and the lid rattled. He saw Harry notice, and set it down carefully. What the king giveth, the king also taketh away. It had taken months of painstaking work to have his father’s regiment provisionally re-commissioned, and more—much more—to find decent officers willing to join it. “The scribblers,“ Harry began, but Hal made a quick, violent gesture, cutting him off. Harry made a soft growling noise, but subsided. He picked up the pot and filled both cups, pushing Hal’s toward him. The regiment—in its resurrected form—had not yet seen service anywhere; it had barely half its complement of men, and most of those didn’t know one end of a musket from the other. He had only a skeleton staff, and while most of his officers were good, solid men, only a handful, like Harry Quarry, had any personal allegiance to him. Any pressure, any hint of scandal—well, any more scandal—and the whole structure could collapse. The remnants to be greedily scooped up or trampled on by Reginald Twelvetrees, Hal’s father’s blackened memory left forever dishonored as a traitor, and his own name dragged further through the mud—painted by the scribblers of the press not only as a cuckold, but a murderer and lunatic. The handle of his porcelain tea-cup broke off suddenly and shot across the table, striking the pot with a tink! The cup itself had cracked right through, and tea ran down his arm, soaking his cuff. He carefully put down the two pieces of the cup and shook tea off his hand. Harry said nothing, but raised one bushy black brow at him. Return to my webpage for SEVEN STONES TO STAND OR FALL. 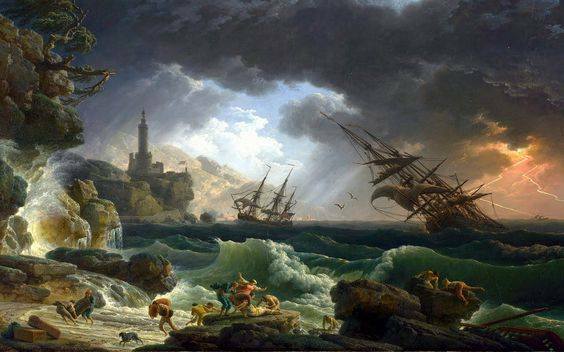 [Thanks for the painting to Claude-Joseph Vernet (1714-1789). This excerpt is from “A Fugitive Green,” in SEVEN STONES TO STAND OR FAL, copyright © 2017 by Diana Gabaldon. All rights reserved. Please do NOT copy all or part of this text, or any of my Excerpts ), and post them elsewhere. Instead, please refer others to this website, and share only the URL of this page. Thank you! This excerpt (aka “Daily Lines”) was also posted on my official Facebook page on August 3, 2018. This page was last updated on Thursday, September 6, 2018 at 3:50 p.m. by Diana’s Webmistress.